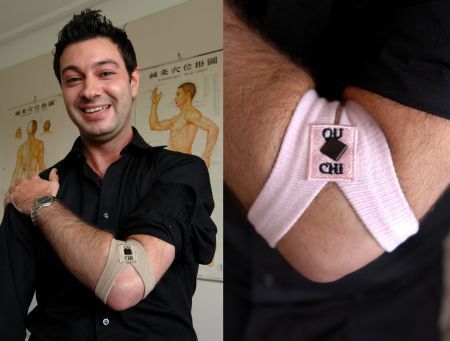 Place the Qu-Chi band over the arm, with the button over the outer elbow, as close to the Qu-chi point as possible. Ensure that one strap is above the elbow and the other is below the elbow. Bend the elbow to ensure that the button is pressing on the outer end of the elbow crease. Adjust the band to ensure a comfortable wearing position. as above very useful i had forgotten since last summer. Borrowed mine from a friend without the instruction….Just put it on (the correct way thanks to you)…will try and report back how it goes…so far, Summer 2013 has just about finished me off with the sniffles and blood shot eyes! Had mine 2 weeks and has made a significant difference, you certainly can tell when you forget to wear it! How tight or loose should the band be. Hi Alan, the band needs to be tight enough to ensure the marble is putting constant pressure on the acupuncture point.